Welcome to the Light Opera Works historical website. For the eighteen seasons he served as Artistic Director, Philip Kraus founded, nurtured and developed one of the premiere operetta companies in the United States. 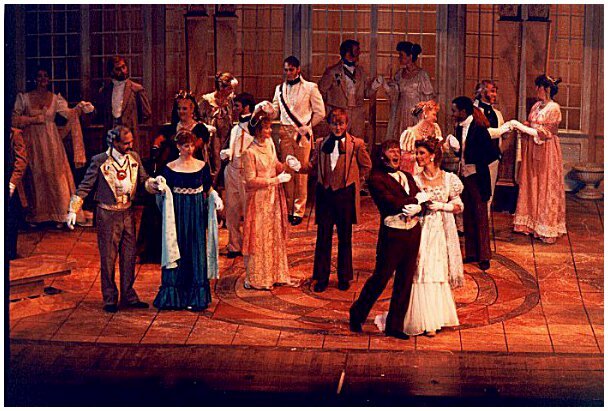 Our website aims to recall what the company used to be and to celebrate the many wonderful productions of classic operettas and musicals deserving of revival, that were hallmarks of what now could be considered the "golden" era of the company. Simply click on any of the links on the left hand side and you will be taken on a unique musical and theatrical journey. Kraus was Artistic Director of Evanston based Light Opera Works from 1981 through 1999 and oversaw 55 productions, stage directing 38 of them. His adventurous programing, research, and desire to bring the art form of operetta back to prominence and popularity were hallmarks of the early history of the company. Before he left, Kraus had presented all the extant operettas of Gilbert and Sullivan. In addition he embarked on two important projects; an Offenbach cycle that saw 5 productions of the French master's masterpieces and a Kurt Weill cycle of the composer's neglected American musical theater works. During his tenure, the company presented the American stage premiere of Kalman's The Duchess of Chicago as well as Chicago premieres of Suppe's The Beautiful Galatea, Offenbach's The Grand Duchess of Gerolstein, Lehar's The Land of Smiles, Strauss' Wiener Blut, Kalman's The Gypsy Princess, Millöcker's The Beggar Student, and Moross' The Golden Apple. Additionally, he presided over a number of important revivals including Straus' The Chocolate Soldier and A Waltz Dream, Romberg's The Student Prince, The New Moon, and The Desert Song, Herbert's The Red Mill, Naughty Marietta, and Babes in Toyland, Coward's Bittersweet, and Weill's Lady in the Dark, Knickerbocker Holiday, and One Touch of Venus. It was important to Kraus to present these works with the composer's original musical text and orchestration as well as staying as true as possible to the original story lines. The Offenbach pieces were presented in their original versions as opposed to the popular arrangements done in the mid 20th century for various opera companies. Kraus was also a stickler for clever, properly rhyming translations of the German and French works. When he couldn't find adequate translations that did justice to the original text, he made his own. Kraus created new translations of Orpheus and the Underworld and Gianni Schicchi for the company and collaborated with Gregory Opelka on new translations of The Chocolate Soldier, A Waltz Dream and The Duchess of Chicago. Obviously, presenting this long term history will take some time, but we hope to have most of the information up by year's end. Please continue to check the site as new things will be posted on an ongoing basis. Most of all, for artists and audience members, please let us know if there is anything you'd like to contribute. Just go to our contact page and email us!! www.lightoperaworks.info is an independant website devoted to the history of the company during the tenure of Artistic Director Philip Kraus and is not affiliated with the Light Opera Works company.